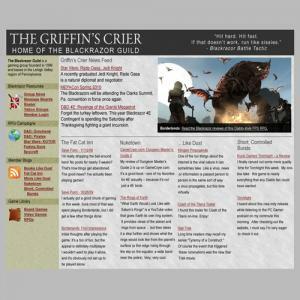 A screenshot of the beta version of the Griffin’s Crier. Credit: Ken Newquist. The Blackrazor Guild — my local gaming group — has had a web site since 1997. It’s gone through many iterations over that time, usually in tandem with some project I needed to research at work (being a gamer means never wanting for large reams of test data for web apps). 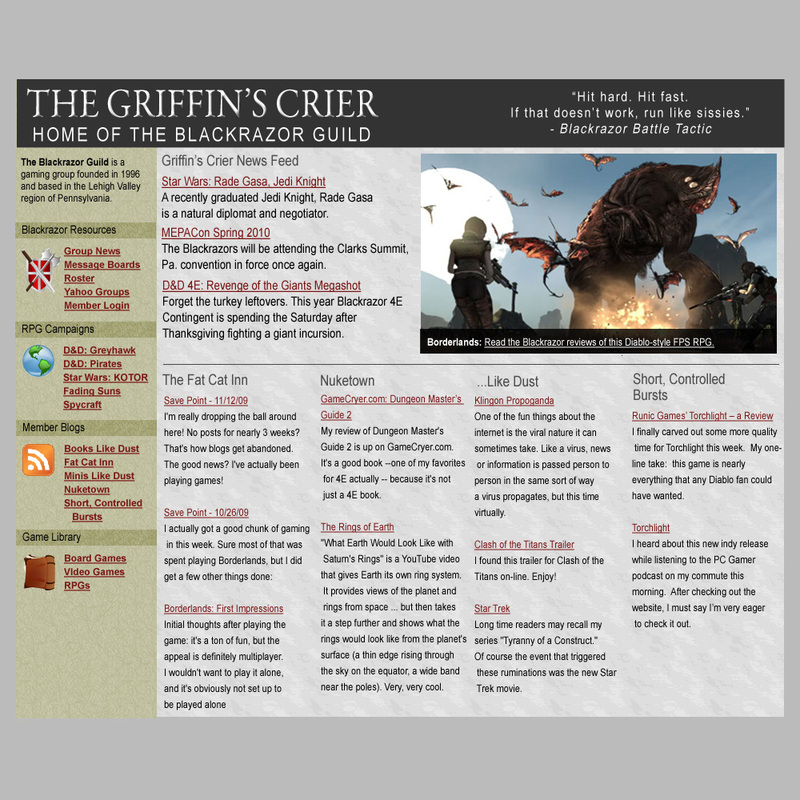 The site’s known as The Griffin’s Crier, and for the longest time it was the archive for our Dungeons & Dragons campaign. However, over the last few years our group’s changed. Our primary campaign’s now Star Wars, half the group is blogging, and we’ve created a small galaxy of spin-off sites supporting our different efforts. The GriffCrier needs to reflect these changes. To that end, I’m redesigning the site using Drupal. The new site will serve as a gathering point for our various interests; it will include campaign and group news, links to the latest blog posts from group members (using the Feed API and Views modules), and serve as a jumping off point to our various wikis, web sites, and forums. The site will also address some long-running needs of the group. I’m going to build a board game library, so we know who has one (using Drupal’s Views and CCK modules) and a private member directory (so we know where to send those Blackrazor Christmas cards). And if I have time, maybe I’ll even port my old PHP dice roller to the new platform. View the full-size mockup of the new site.